Here is a view of what the system looks like. Note the red peak in the lower chart. This indicates that a low has been hit. The horizontal green line intersects the red peak. Where it intersects on the right side of the peak (the trailing edge, as the engineers would say), we have a Buy signal. 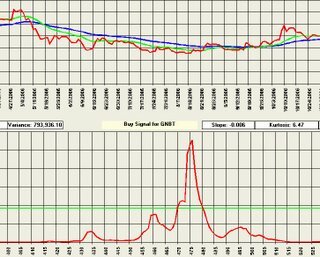 This Buy signal is clearly earlier than that provided by the 20-day EMA moving above the 50-day EMA, for example. That is the benefit this system attempts to provide, an earlier signal that is still reliable. To make it interesting, I did put a few dollars on this one though a bit later than the date the system indicated. I consider this signal to be "decent" because the peak is kind of sloppy at the bottom which also causes my Signal-to-Noise indicator to be a bit weak. In any case, if you had bought when the signal indicated (at $1.69 on 8/24/06), you'd be sitting on a 20% profit today, two and a half months after entering the trade. 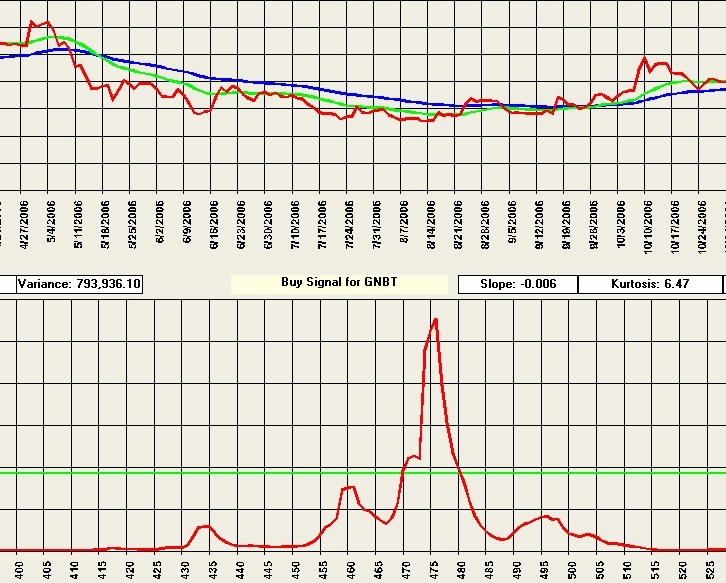 I'll provide more information on the confirming signal statistics in later posts. Today’s GNBT’s announcement of Craig Eagle, M.D. to its scientific advisory board is an important move. Dr. Eagle’s connection with Pfizer is GNBT’s first step toward partnership with Pfizer. This partnership will open a huge market to GNBT and give Pfizer access to products it does not have. GNBT is very close to get the FDA approval for its drug delivery system and is going to need Pfizer like company to help put it on the map. Great move by GNBT.